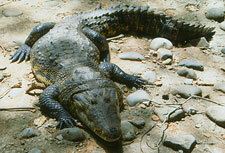 ‘Alligator’ is Number One in the cycle of twenty calendar or day signs in the Aztecs’ sacred calendar. While the earth monster slept, humans enjoyed the fruits of the earth - look for the ears of maize growing from the back of the monster! When, however, the creature awoke and stretched, the Aztecs experienced sudden, deadly movements in the earth itself - earthquakes! 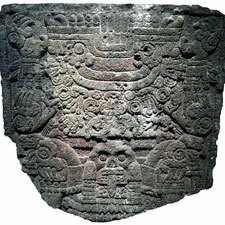 Whilst the (horizontal) earth space itself was called in the Aztec language of Náhuatl cem-anáhuac (‘the place surrounded by water’), the name for the giant earth creature was cipactli. Whilst the earth monster was asleep, humans enjoyed the fruits of the earth - ears of maize can clearly be seen growing from the back of the monster in the Codex Borgia image (Pic 1). When, however, the creature awoke and stretched, the Aztecs experienced sudden, deadly movements in the earth itself - in other words, earthquakes. Even today, Zapotec Indians call the caimán the pichijlla, meaning ‘the spiny one’. According to Donald Cordry, a renowned 20th century ethnographer and expert on Mexican masks, The Indian names for the earth monster assume great importance in relationship to modern Caiman masks when one notices that the Caiman step-in figures in the Caiman Dance in Guerrero have spines from the pochote [also known as the ‘silk-cotton’ or Ceiba] tree on their backs that are remarkably similar to the representation of the spines growing from the back of the cipactli, and Caiman masks also have pochote spines. 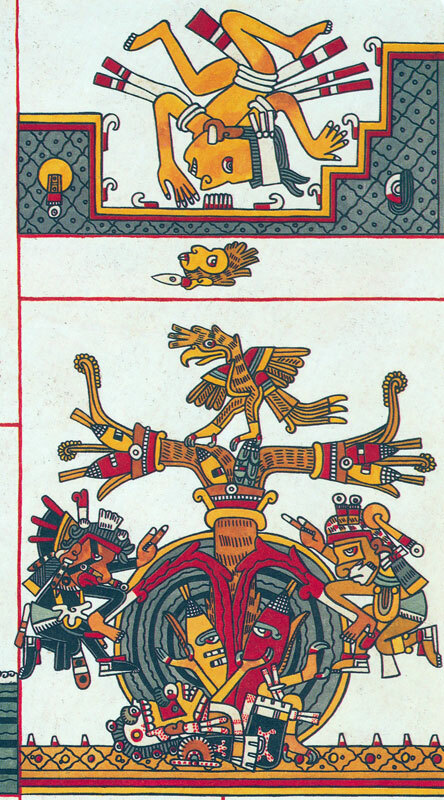 From certain drawings in the codices, one wonders whether effigies [figures] in pre-Hispanic times were made using pochote spines as now. Being the giant spikes of the earth monster, mountains held a special meaning for the Aztecs: forming part of a sacred landscape, mountains were the source of the earth’s life force, food and sustenance. The Aztec word for city, altépetl means ‘water mountain’ or water-producing mountain, and spells out the deep awareness and sensitivity the Aztecs showed for the close links between key forces in their natural world. Our understanding today of the ‘food chain’ and the ‘water cycle’ is rooted firmly in the wisdom of ancient peoples, who were only too aware of the cyclical forces at the heart of our universe. 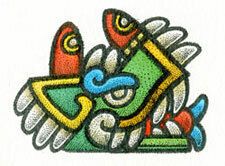 In Picture 5, from the Codex Borgia, a large green maize plant produces ears of corn as its fruit. The tree grows out of the earth monster alongside two huge ears of corn. 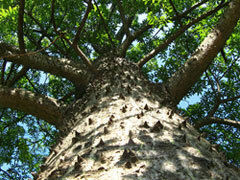 The figures of two gods perform self-sacrifice on either side, spilling blood onto the base of the tree. The whole image beautifully illustrates the idea of ‘the people feed the earth their blood and their bodies, and in return the earth feeds the people by yielding maize’. Above it, a human figure descends into the mouth of the earth monster (with a particularly rectangular, architectural look about it). Images of Tlaltecuhtli - similar to the one in Picture 6 - were often carved on the undersides of Aztec monuments so that they would face directly, and reflect, the surface of the Earth Monster itself. 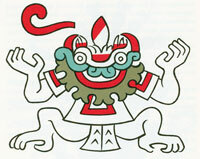 The great earth deity, both male and female, was commonly shown in a squatting position with knees bent, similar to the traditional position of native Mexican women giving birth. The open jaws of the monster, ready to consume its victims - described by Esther Pasztory as ‘one of the most powerful images of Aztec art’ - were imagined to be the entrance to the underworld, and the Sun Tonatiuh was believed to be devoured by the Earth Monster every evening - to be reborn thankfully the next morning out of the Monster’s womb. According to the person’s status, an Aztec’s dead body would either be cremated or buried, so returning finally to the interior, to the womb, of Mother Earth. 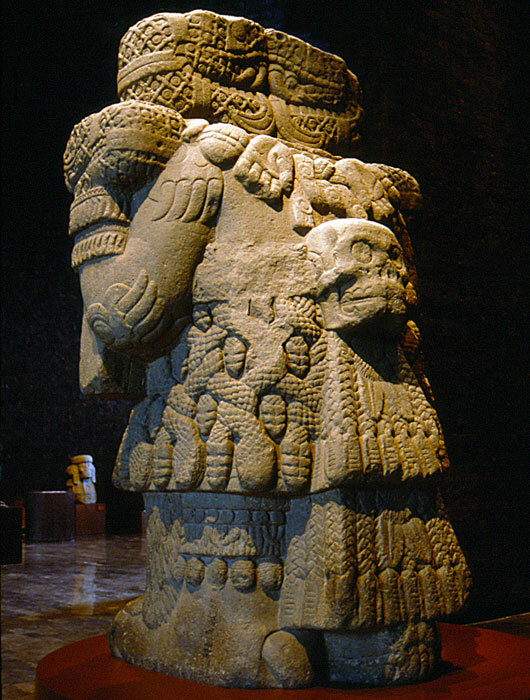 The body or ashes stayed in the soil, nourishing and feeding Tlaltecuhtli/Coatlicue, whilst the soul generally travelled to one of four paradises or final resting places, determined largely by the way in which the person had died. For most, the journey to the underworld (Mictlan) was long and hard, and involved a series of 9 obstacles or challenges, each governed by one of the nine Lords of the Night - seen by some scholars as matching the 9 months/moons of human pregnancy, but in reverse, a return journey, the completion of the cycle. As my grandson Luca would say ‘We made it, Nana!’ Home sweet home! 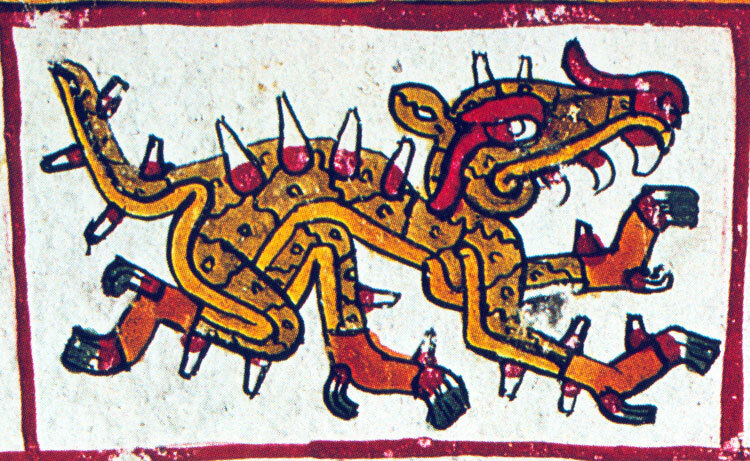 *The Historia de los Mexicanos por sus Pinturas depicts the earth as the ginormous spiny monster Cipactli, whereas the Historia Eclesiástica Indiana by Fray Gerónimo de Mendieta depicts it as the giant toad Tlaltecuhtli, that ‘swallows the sun in the evening and spews it forth at dawn’. Both are respected 16th century sources. 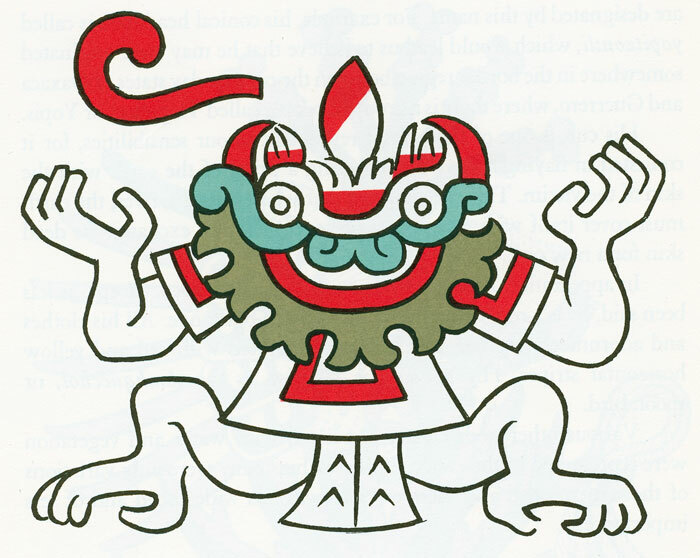 When the great earth monster Cipactli awoke and stretched - causing the earth to quake - Aztec parents rushed to stretch their children quickly by the neck, to encourage them to grow!